There was a strong connection with these families through church and family ties, shown in parish records, for both Bromborough and Eastham. Are there any descendants of these families who possess diaries/records of the early 1800s which might suggest how and where the children of these families were educated? Also, why in the 1820s did some members decide to emmigrate to Australia? Any information would be welcome as I would love to make contact with anyone with ideas!. To Colonise and what looked like favourable terms and opportunity. Newspaper snippet, 1829. Thankyou Bertieone for this information. 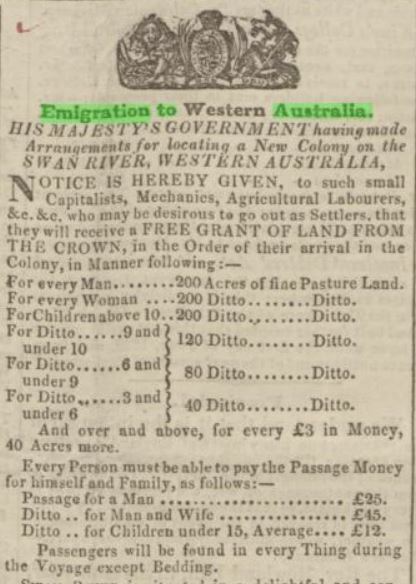 The cost of passage money to Western Australia in 1829 is interesting. I think the Swan River settlement wasn't very successful.. In Tasmania (another Australian state) 'Early free settlers in the 1820s could obtain land grants based on the money they brought into the colony and if they appeared to be 'suitable' people with letters of recommendation'. Members of the Barnes, Wilson and Manifold families from the Wirral arrived this way. As these young men had a good basic education, I was trying to work out where they may have gone to school. Also, trying to find out if any descendants of these families still live on the Wirral?